Today’s shopper is more empowered – mobile, connected, and informed – than ever before. Digital marketers are simultaneously emboldened by and queasy about the increasing leverage wielded by today’s shopping consumer. With both progressive change (on-line research, social sentiment, mobile search) and disruptive change (real-time price comparison, couponing, conquesting) to deal with, marketers can’t help but feel less in control than desired these days. The reality is that these changes are inexorable and increasing. Consumers scan products all over the world every day. 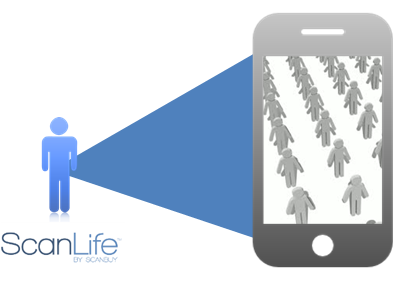 For years, Scanbuy has delivered brands and retailers access to the data that consumers scan regarding their products. Recently, we have expanded our data business in ways that could be more valuable. We classify our data into product categories and audience segments, often identifying where the product was scanned, and the gender and age range of these consumers. Scanning is an intentional, purposeful act. We consider this data to be bottom-of-the-funnel marketing information, and use it as seed data to broaden our segments and build better targeting campaigns. We can hyper-target a strong-affinity sub-segment or build “act-alike” models to expand a target audience. Because we start with higher-quality data, the value of these data models persists with less degradation as the audience size expands, unlike more traditional on-line campaigns. Finally, we can co-mingle this data with in-house data (CRM, web, or other) to drive superior A/B tests, campaign results, and measurable ROI. 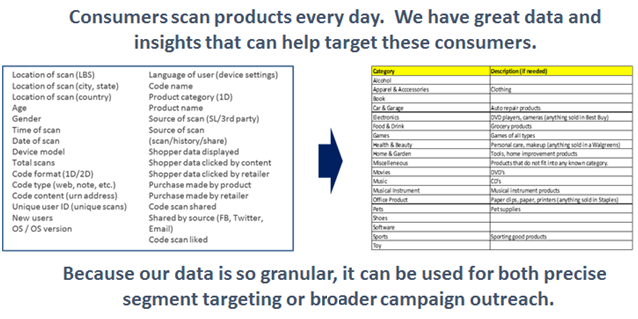 Consumer scan data is an authentic, bottom-funnel signal that someone is, at minimum, curious about a product and brand, and more likely, ready to engage with the product or make a purchase. Capturing this “moment of truth” data, and putting it to good use for digital marketers, is our business. Please consider working with us to achieve the results we see every day.